Opened June 12, 1930. Taken over by Majestic-Star Entertainment in November 2010. Note: The web sites listed on this page are operated by third-party organizations. As such, we cannot be responsible for their content, appropriateness, and quality. Visiting these links constitutes an agreement by you of this fact; please click responsibly. If we are missing a related web site for this theater, or if you find that the links above are in error, or contain objectionable content, please complete the Feedback Form and let us know what you have found so that we can investigate further. Please note: Direct links to the theater's web site, Facebook page, and Twitter feed in the sidebar are available only to VIP Members. 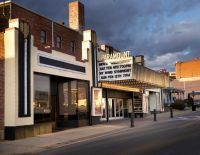 This movie theater is near Scotchtown, Middletown, Howells, Circleville, Slate Hill, Goshen, Otisville, Johnson, New Hampton, Bullville, Bloomingburg.